If you are missing multiple teeth, an implant-supported bridge can replace them. This procedure is performed like any other bridge, except with the use of dental implants instead of natural teeth. 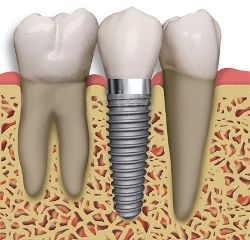 Dental implants physically bond to your jawbone and are as strong as natural teeth. Implant-supported bridges are recommended for multiple missing teeth. If you only have one missing tooth to replace, then please visit our page on single tooth dental implants. One or more implants are placed to support the bridge, and then the bone is allowed to heal and bond to the implants, a process called osseointegration. Then the implants are uncovered and abutments are attached to them. The bridge is constructed over the abutments. Maintenance – implants cannot be destroyed by decay or cavities (though they must still be cared for like real teeth with normal brushing and flossing routine). Preservation – implant-supported bridges replace the tooth’s roots that helps to preserve your tooth’s bone. Traditional bridges may aid in the deterioration of the tooth’s bone. Leaves Natural Teeth Alone – this type of restoration does not affect your surrounding natural teeth. They will remain healthy and are not subjected to the pressure of supporting the bridge. If you think you may be a candidate for implant-supported bridges, complete our request an appointment page, or call our office to schedule an examination. If you aren’t ready to commit to an examination, you can ask for a brief complimentary consultation, during which you will have a few minutes to ask Dr. Thein questions.